A unique figure around the forests and glens of the capital city of Aelvinwode, Puck the Magnificent (merely one of his many titles) is famous (infamous?) and is a rumored figure of tales throughout the area. Famous (notorious) for his many pranks, Puck’s name has become almost a swear word among the militia and the town guard, those most often subjected to his tricks. While some of his jokes could be considered going to far, Puck feels that those who disparage him need to get a better sense of humor, a task he is always happy to help with. Surely anyone can see the humor of making a mud hole look like solid green grass. Or better yet, a nest of ground bees that looks like solid green grass. And putting an opening in the brush that looks like an escape route from the bees, but actually isn’t there? Classic. Some rumors say that lost children have been found by following well placed signs that disappeared shorty after the children were located. The guard however says those tales of Puck being helpful are nothing but merde. 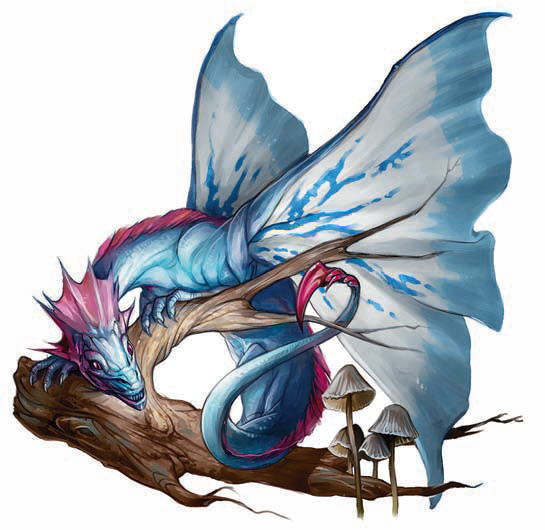 Puck’s unique nature shows in his enhanced ability to cast Minor Illusions, with the Faerie Dragon somehow being able to cast them at will. He currently wears a necklace of incredible glamour given to him by his pet alfar.